One of the joys of getting ready for a move is discovering all of the things that were never unpacked from the last move. Seriously it is ridiculous what we stored and never even looked at. I blame it on …. oh I don’t know. I don’t have any good thing to blame it on. As I am writing this the packers, two lovely ladies, are packing up teapots. They came in, surveyed the damage and decided wisely to get those puppies done and dusted right off the bat. There is not much talking but a lot of crinkling paper. Yes, they knew that there was a collection and have assured me that it is nothing like some collections they have packed. Whew. 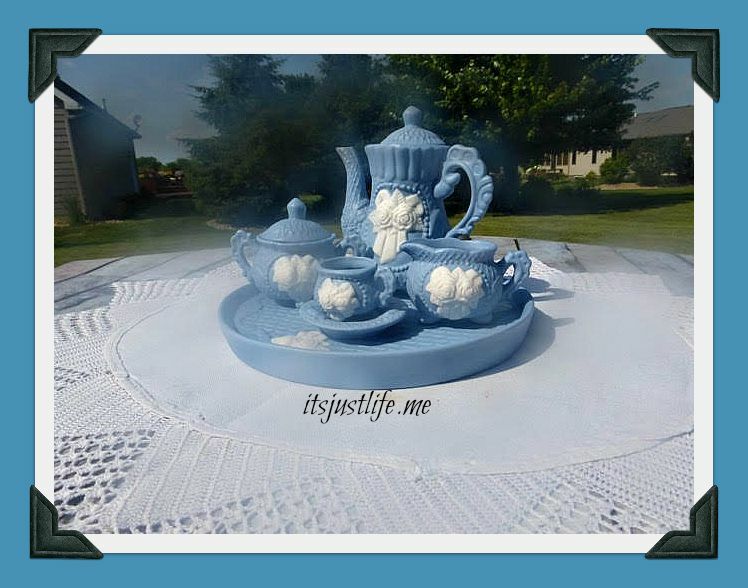 Join me today as I start my presentation of some of my miniature tea sets. Many are whimsical. None are really functional but then who says a cute tea set has to hold tea after all? It is seriously a really cute little set, isn’t it? 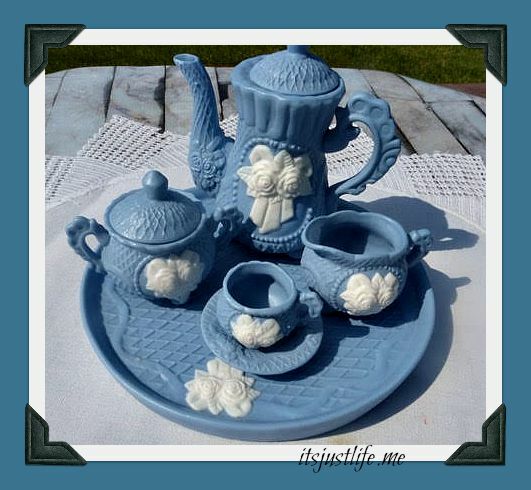 Made to look like a Wedgwood set in color but a sweet little set that looks lovely just sitting on a shelf. ← Previous Lay’s Do Us A Flavor Is BACK! Sooooo cute! Yes, it is amazing what you discover when you pack up to move. I´m sure those packers did a great job. Everything arrived safely to Spain so I´m sure your boxes will travel across the US just fine. We will see in a few weeks!! But yes—we really had the best packers and movers this time on the Iowa end so hopefully on the NC end later in August they will be the best as well. Adorable! Love it and your collection! I can’t wait to see more. Something I had completely forgotten about is that I had started a small teapot collection for my mom several years ago! Most are miniature, but I did buy her a functioning one also! While that never continued, she still has them all…maybe I’ll have to do a spin-off of Teapot Tuesday over on my blog! Very nice. Leaving a comment quickly ha! I know. You gotta be fast here lately!!! Gee whiz. I have not ! Thanks so much for stopping by again. I am so grateful for anyone who takes the time to stop and leave a comment. glad to hear you have good packers. I am finding lots of things as I am clearing out some things I no longer need. Some are hard to give up. Mom was a tea pot collector. The teapots are now scattered to the homes of sons, daughters and grandchildren. I also have quite a few memories of the “packers” and the crinkling of the paper. I am sure that your mom’s teapots are all being loved and cherished in their new homes. And yes–that sound of crinkling paper is a very vivid memory. That is a cute teapot set. You don’t have to move to wonder why you have saved things. The other day I found a big stack of address labels carefully saved -with my name spelled incorrectly! I guess I thought I might have to suddenly send 2000 letters! Ha! I have not made any good finds at the thrift shops lately. Oh bummer. I guess it goes like that sometimes. That is why you have to keep going back, right? Thanks for stopping by! Wedgewoood is one of my very favourites!! I was rather wondering if you had a set like this. I always keep an eye out at my local antique store because I would love a sugar and creamer set in Wedgewood. It is pretty hard to find Wedgwood in thrift stores in Iowa so now I will have whole new territories to explore. Who knows??? That is cute, and Wedgewood came to mind as soon as I saw the colors. Yep. You know your colors! It is adorable. Yep. Exactly. I am feeling ya.